Este efecto lo podemos observar hoy en día, con una especie de mono que vive en campo abierto (Chlorocebus aethiops). Este simio tiene una sensibilidad auditiva muy ancha (entre 1 y 8 kHz) y es capaz de generar un amplio repertorio de gritos variados para dar una alerta distinta ante peligros diferentes, distinguiendo por ejemplo si el depredador que amenaza al grupo es una serpiente o un felino. Algunos de los sonidos que emite alcanzan los 5 kHz. Por supuesto, no puedo finalizar este artículo sin mencionar el primer trabajo de estas características en 2004, por Ignacio Martínez (también coautor del trabajo anterior) y otros colegas , que abordaba las capacidades auditivas de 5 especímenes de la Sima de los Huesos (Atapuerca), datados en 430 ka: el famoso Cráneo 5, otro individuo adulto y tres juveniles. Este estudio mostraba una sensibilidad auditiva en estos homininos muy similar a la de los humanos modernos, en particular con una sensibilidad todavía significativa alrededor de los 4 kHz. Si los preneandertales ya eran capaces de oír como nosotros, ¿tal vez también lo eran de comunicarse como nosotros? Let me start with the paranthropines – for which I have a soft spot -, our weird distant cousins that lived until only 1 million years ago. Their fossil record is still very limited (around 700 specimens between East and South Africa). However, we know quite a lot about their amazing cranial morphology – hyper-specialized in chewing -, we know less about their post-cranial morphology, and quite little about their behaviour, although there are some very interesting studies. Modern humans have a wide range of auditory sensitivity between 1 and 4.5 kHz. For example, 4 kHz is the threshold of the frequency range reserved for voice in telecommunications (above 4 kHz is for data). Those hominines were not able to hear like us, in the frequencies we use. The paranthropines and australopithecines had a sensitivity range between 0.8 and 3.3 kHz, with a peak between 1.5 and 3 kHz. Paranthropines and australopithecines had a similar auditory ability to chimpanzees, which have a higher sensitivity between 0.6 and 3 KHz and a peak of 1 kHz. From 3.5 kHz onwards, none of them could hear well, while modern humans still hear well up to 4.5 kHz. In particular, those hominines were unable to hear certain key sounds in the human speech, such as those we can hear when we pronounce the consonants. The ability to capture more variety and richness of sounds is especially remarkable with consonants, which provide more information in the human communication. Therefore, if we try to link this study of the hominin auditory capacity with the relationship between hearing and speech, we can infer that those hominines were not able to speak, their sounds could not be as complex or articulated as human speech. However, paranthropines and australopithecines show a slightly more adapted sensitivity to intermediate frequencies, while in chimps such sensitivity decreases earlier. Their hearing ability was preparing for the sounds of open spaces, where it is estimated that half of the resources they consumed came from. In a wooded environment there is a lot of environmental noise (in intermediate frequencies) generated by insects, amphibians, reptiles and other animals…. But in the savannah, in open spaces, the environmental noise is less, therefore it is a more appropriate environment for communication in the frequencies that today we use humans. 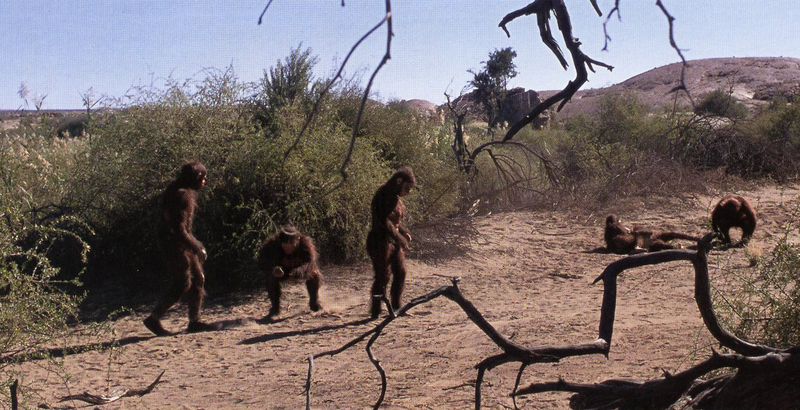 Those hominines were adapting to the open field widening their auditory sensitivity in that range. This effect can also be observed today, with a species of monkey that lives in open spaces (Chlorocebus aethiops). This ape has a very wide auditory sensitivity (between 1 and 8 kHz) and is able to generate a wide range of calls to communicate different warning sounds according to different dangers, distinguishing for example whether a predator threatening the group is a snake or a feline. Some of those calls can reach 5 kHz. Of course, I cannot finish this article without mentioning the first work in 2014 with the above’s approach, by Ignacio Martínez (also coauthor of the previous one) and colleagues. They analyzed the auditory capacities of 5 specimens from Sima de los Huesos, Atapuerca, dated to 430 ka: the famous Cranium 5, another adult and three juvenile individuals. 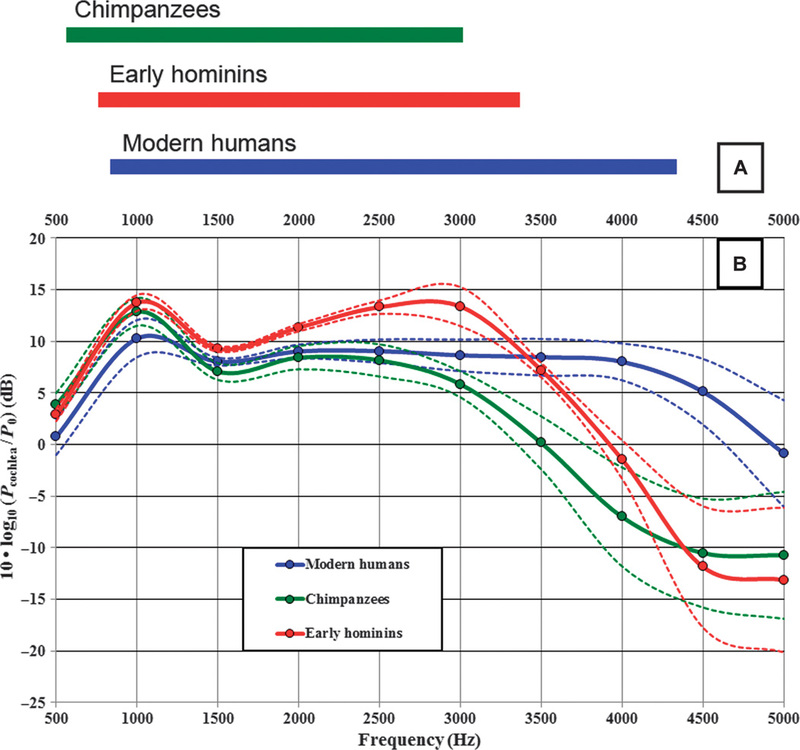 The results showed an auditory sensitivity in these hominines very similar to that of modern humans, particularly with a sensitivity still significant around 4 kHz. If the preneandertals were already capable to hear like us, perhaps they were also capable to communicate like us? Esta entrada fue publicada en Reflexiones y etiquetada Australopithecus, Neandertal, Paranthropus. Guarda el enlace permanente.